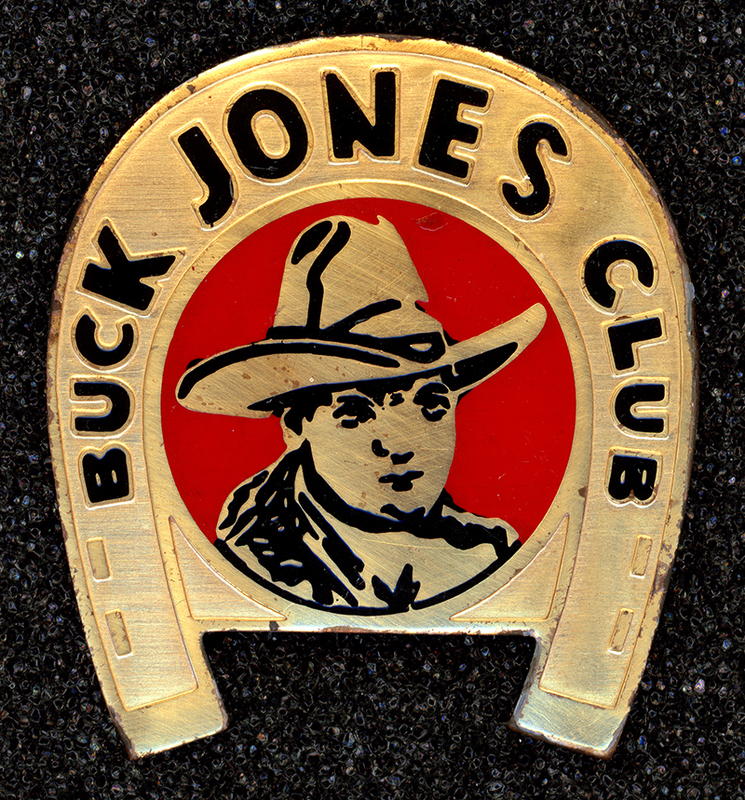 SCVHistory.com LW2812 | Film-Arts | Buck Jones Club Membership Badge ~1937. What kid wouldn't want to be a member of the Buck Jones Club? Galloping across the silver screen in places like Placerita Canyon and Vasquez Rocks, Jones was one of the bigger movie stars of the 1920s and '30s — and he was really good at monetizing his fame through various product endorsements. This red, black and gold, 1¼x1½-inch die-cut pinback in the shape of a horseshoe dates from about 1937, when Post Grape-Nuts Flakes cereal sponsored a syndicated 15-minute radio program starring Jones, called "Hoofbeats." Among the various club premiums, the membership badge was the lure; it took just one box-top to become an official member and receive the badge — along with a catalog and instructions for ordering more fabulous prizes. For another box-top, members would receive a photo of their cowboy hero; for 3 box-tops they got their choice of a membership ring or a Junior Sheriff badge. True devotees could send away for a lariat (18 box-tops), a cowboy hat (72) or chaps (103). Postage stamps and money orders were also accepted as partial payment. By the late 1930s, the Buck Jones Club sported some 5 million members. LW2812: 19200 dpi jpeg from original pinback purchased 2015 by Leon Worden.